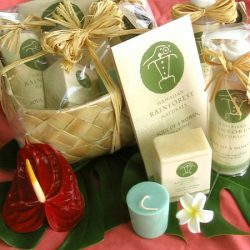 Spa Gifts from Hawaii - Natural soaps, lotions and bath crystals. Made with Hawaiian flowers and oils. 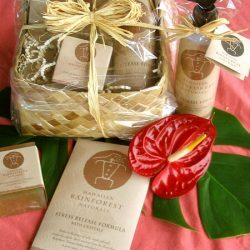 Soul of a Woman Body Lotion A nature body lotion made in Hawaii with the essences flowers and plants from the Hawaiian rainforest. Refreshing and moisturizing. 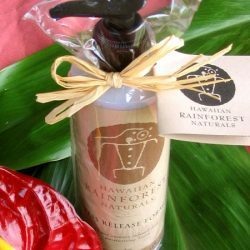 Stress Release Moisturizing Lotion Made in Hawaii with stress release in mind this rich lotion is infused with the essences of Hawaiian flowers including lehua, yellow ginger and kinehe. With added vitamins A, D and E to nourish your skin. 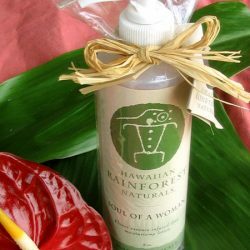 Soul of a Woman Natural Body Mist Natural body mist made by Hawaiian Rainforest Naturals. 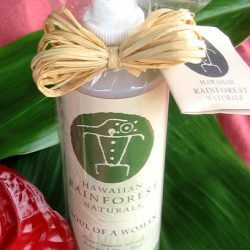 This after shower body mist is made from the local essences of banana, mango, lehua and ginger. 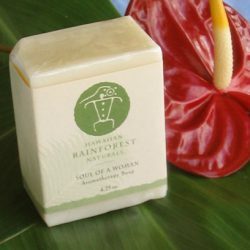 Soul of a Woman Natural Soap Natural soap made in Hawaii. 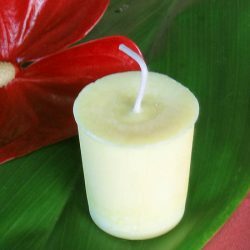 Glycerin base with coconut milk infusion. 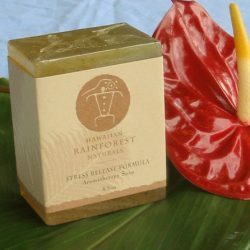 Stress Release Natural Soap Stress release formula natural soap made here in Hawaii. Soothing flower essences to cleanse, refresh and wash away stress. 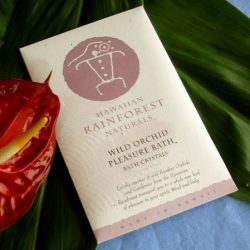 Wild Orchid Natural Soap This Hawaiian made Wild Orchid Bath Soap is made with plant based glycerin and scented with gardenia. Stress Release Bath Crystals Stress release bath crystals. 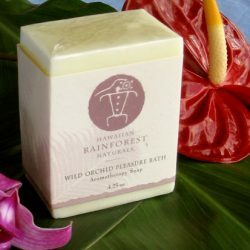 Made with essential oils flowers essences of yellow ginger, kinehe, and lehua. 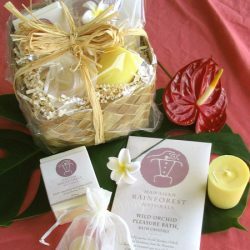 Great for a relaxing, stress relieving bath. One packet for each bath. Wild Orchid Bath Crystals Wild Orchid bath crystals. 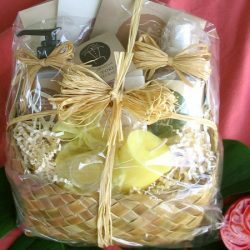 Enjoy a bath with this infusion of Hawaiian flowers including gardenia and bamboo orchid.